Do I need a decent pc to play this? No, you can also use a laptop. Just bought it. Should be fun having a mess about with GMod. Been watching all the TF2 videos made with it. youtube.com/wat…pAQ I thought was good. Just bought it. Should be fun having a mess about with GMod. Been … Just bought it. Should be fun having a mess about with GMod. Been watching all the TF2 videos made with it.http://www.youtube.com/watch?v=Mw0re7xmpAQ I thought was good. That was actually made with Source Film Maker which is free. Ah.. oh well some others I've watched are definitely made with GMod. Think these must have been the 1st 2 game I ever brought on Steam. Both epic titles at smokin' hot prices! Think these must have been the 1st 2 game I ever brought on Steam. Both … Think these must have been the 1st 2 game I ever brought on Steam. Both epic titles at smokin' hot prices! I finally bit the bullet in 2004 thanks to Half-Life 2. Oh hang on, i've purchased it 3 times now. Once because I could no longer access my account to play it. Can't find a beginers game,last about 2 seconds. Wonder where is Non-steam players, or Steam players? i mean legal or illegal? HAD 30+ friends and all non-steam. Great deal. CS:GO is only £5.99 this weekend too. 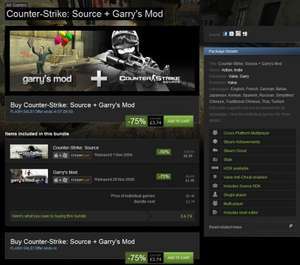 You can get the complete counter strike set for £8.49. What's Gary's mod?